Giving Hope Lawn Management is proud to serve the community of Ashland with professional lawn care and landscaping services. For more information or to get a free quote call us today at 804-405-0211. Just one short stroll down the historic roads or even outside city hall proves that Ashland, VA, cares about its vibrant plants. But keeping all those lush trees, grass, and bushes is hard work! Most people find that they just can’t take care of their landscaping chores themselves. 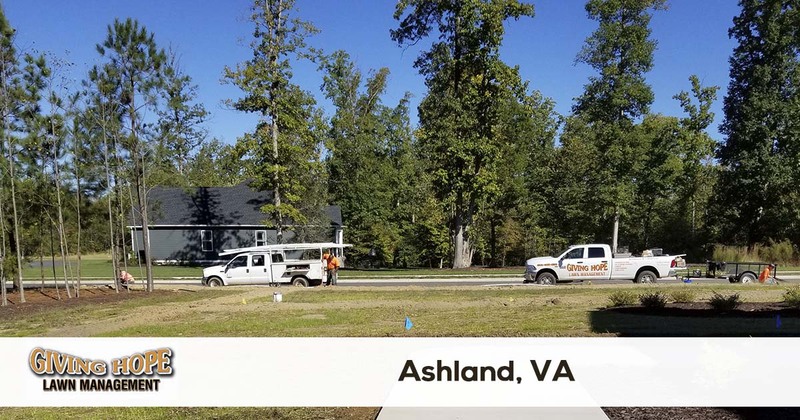 But when everyone hires a company for their home or business, it may feel like quality Ashland lawn care remains in short supply. Instead, you can hire the team that gets the best results with every visit to your property. Since 2011, Giving Hope Lawn Management has kept Ashland greener for less! When you need expert landscaping services offered at affordable pricing, you need us to help you. We can take on any outdoor project you have, saving you a ton in the process. From monthly grass mowing to irrigation systems services, we handle it all! We’ve never met a project that we couldn’t finish, and we don’t stop until you’re satisfied with the results. We offer everything you need for better curb appeal and increased plant health. When you need a green thumb for your yard, you won’t find a better team than ours! Call today for all your yard care service needs and save more each time. We offer more lawn care services than anyone else around! Stop trying to keep your yard up without the professional tools and know-how. Instead, get your weekends back and hire the affordable landscaping experts for your yards! Giving Hope Lawn Management is the industry leader for lawn care and landscaping in Ashland. We offer a 100% satisfaction guarantee with all of our services, so there is no risk for you to give us a try. Give us a call today for the fastest service at 804-405-0211.